Even without injured Tony Parker, the Spurs found the way to get the road win and took control of the West semifinals against Houston. The final score was 103-92 as LaMarcus Aldridge and Kawhi Leonard scored 26 points apiece in San Antonio’s first postseason game without Parker since 2001, which ended an NBA record of 221 straight playoff appearances for the Frenchman. 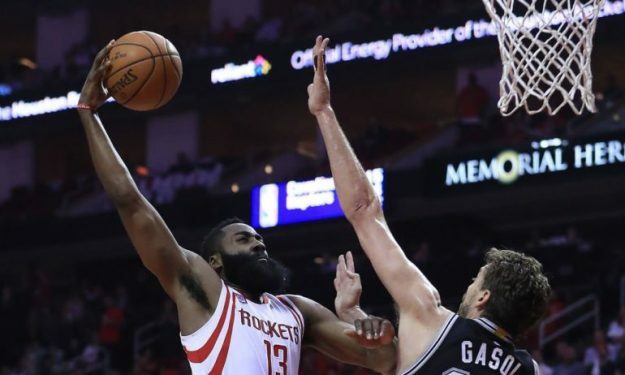 Spaniard Pau Gasol had 12 points and 9 rebounds, while James Harden led the Rockets with 43 point and Swiss Clint Capela had 12 points and 16 rebounds. In the East, Lebron James scored 35 points, Kevin Love had 16 points and 13 rebounds, and the Cavaliers pulled away in the fourth quarter to beat the Toronto Raptors 115-94 and take a 3-0 lead in their second-round playoff series. DeMar DeRozan scored 37 points and Lithuanian big man Jonas Valanciunas had 19 for the Raptors, who were without three-time All-Star Kyle Lowry. Spaniard Serge Ibaka had 12 for the Raptors.